Today I met with one of my local Facebook team members as we were partnering on a client initiative and our conversation sparked an interesting thought about the future of newsfeed publishing and how brands should be thinking about maximizing their publishing strategies as Facebook’s platform continues to evolve. This was an incredibly simple statement that all of us who publish on behalf of brands sometimes take for granted. The numbers definitely back up the statement with 115 billion impressions served daily via desktop and 65 billion newsfeed impressions served daily via mobile. 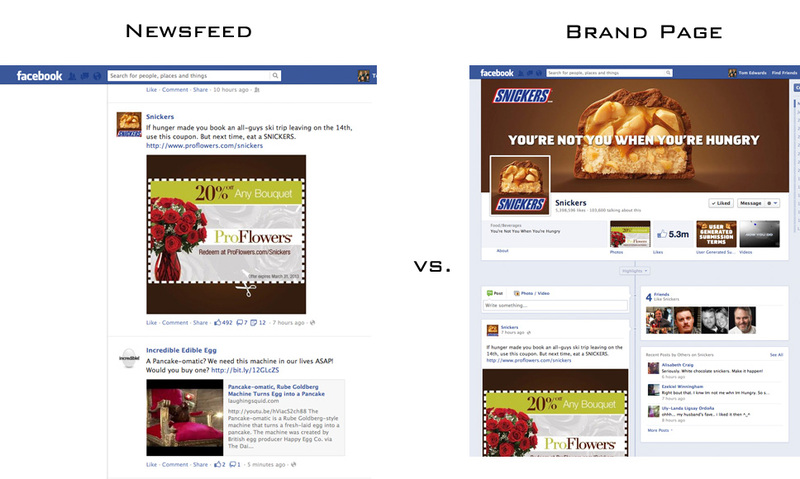 Think about your own behavior when it comes to interacting with brand related content on Facebook. How often are you clicking through to a brands page to consume their content? 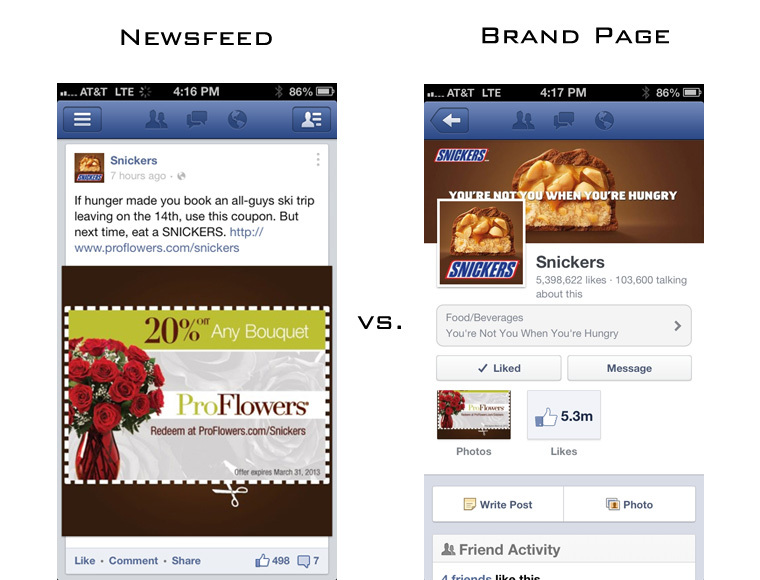 This divide is even better visualized when it comes to users mobile interactions? Where do you consume brand messages on the desktop? This becomes even more apparent via mobile! The reality is most social interaction happens via the newsfeed. Interactions being likes, comments and shares. Most brands approach content publishing from the perspective that users come to the brands’ page and consume their content in a linear manner. The reality is brands need to create a publishing strategy that is optimized for Edgerank and based on deliberate content buckets that are relevant & engaging for the brands audience that can be consumed in a non-linear manner but still represent the core social persona of the brand. This requires a detailed strategy that is grounded in the core attributes of the brand that then leads to content pillars that are designed to maximize engagement. The following graphic represents the % breakdown across interaction types. With so much consumption happening via the newsfeed, shouldn’t the in-stream experience/opportunities be as relevant and compelling as possible? This leads me to what I see as the next step in the evolution of brand publishing and that is going a step beyond visual storytelling and incorporating compelling interactive experiences to enhance the publishing strategy. The recent announcement and coverage of Stipple’s Facebook support and subsequent usage by Justin Timberlake to provide interactive cover art is a glimpse into the future of newsfeed publishing. Interactive posting is not a new concept. 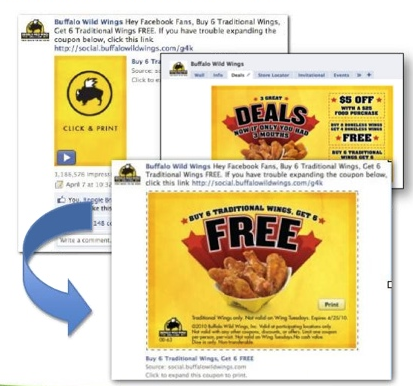 I remember first seeing this executed by Vitrue’s platform back in 2011 via the Buffalo Wild Wings example below. Leveraging this type of interactive content publishing was one of the enabling factors that has driven Buffalo Wild Wings to acquire over 9 million fans. Their content strategy has led to an engagement rate of 4.8% over the last 30 days with over 477,000 interactions. Having a point of differentiation in-stream has led to positive results for the brand. The real key point of differentiation now vs. then is the ability to create immersive newsfeed experiences for both desktop & mobile by leveraging responsive design. 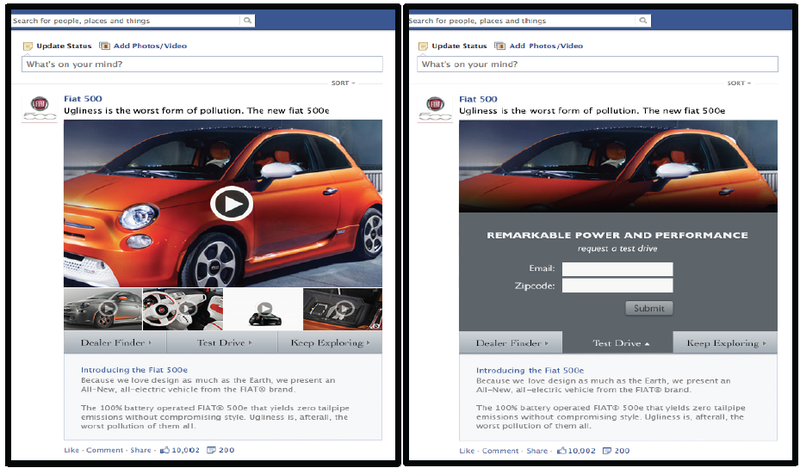 Now it becomes easier to publish across both desktop & mobile to drive in-stream & even in-app (Facebook’s app) interaction. The example below shows an example from Shop Igniter’s platform that enables in-stream video that then drives to a mobile optimized experience based on responsive design that allows the flexibility of staying within the application, but also allows the addition of an action object in the experience that extends the reach of a users action beyond the newsfeed into the activity ticker. This is a key element to further drive distribution and discoverability of content as well as the fact that the newsfeed does not support action objects directly. 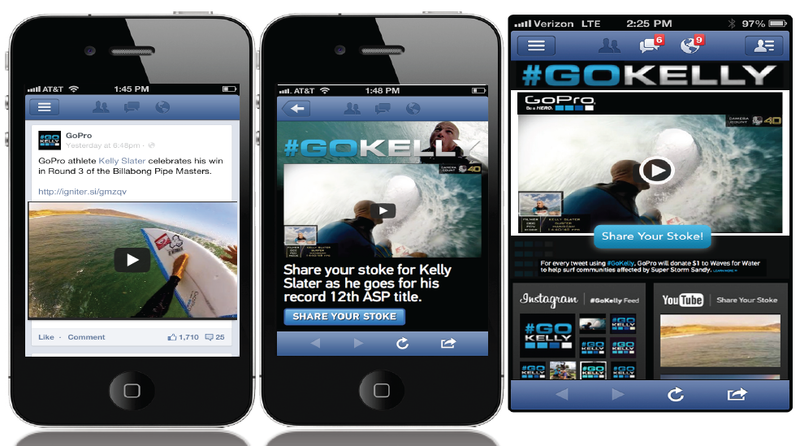 The GoPro example is a great example of a light weight execution that does not rely on driving to an end destination to generate engagement & story creation. This in my mind is the next evolution of content publishing in-stream. Similar to the evolution of static banners to rich media, creating compelling content that is optimized for EdgeRank, light weight in design and contains the experience within the existing stream and Facebook application across both desktop and mobile that also taps into the social graph to append actions is an ideal addition to an owned content strategy. This also maximizes the principles of real-time paid amplification that I have discussed in the past because these are actual posts being created on Facebook’s platform that can fit seamlessly into a paid media strategy. The other benefit to this type of publishing is the engagement data on the content level that can drive further optimization of content moving forward. By tracking impressions, engagement rate and social actions, we can directly map to our core KPI’s. When it comes to Facebook, it is not enough to just have a content calendar. It is incredibly important to have a true strategic framework that outlines the brands publishing strategy and how the content will be optimized to drive targeted reach, but it is also important to leverage interactive assets to drive tangible results and activation where appropriate.